What are the best romantic attractions in Venice? Not all backpackers out there are young singles; indeed, there are recently married couples that also choose to travel the world on a budget, and while they too take pleasure in experiencing the best it has to offer without spending too much money, some destinations deserve to have the purse string loosened. If you are a backpacking couple, and you want to fully experience the best romantic attractions in Venice, don’t be afraid to spend some cash. Go on, you know you want to. It’s the ultimate travel cliché when one thinks of Venice, but it is incredibly romantic to go on a gondola ride. Trust us guys, you need to do this with your significant other, as the atmosphere created when riding in your own private boat between perfectly sculpted buildings and underneath centuries old bridges is incredibly conducive to love. 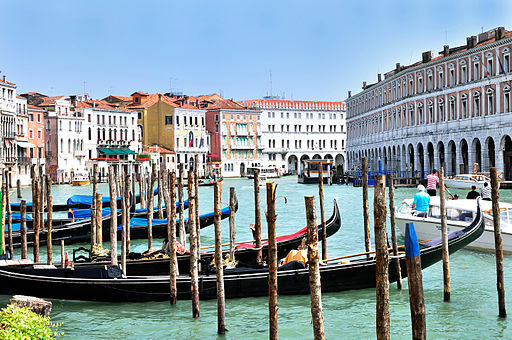 While this activity isn’t a cheap one, save yourself a ton of money by agreeing on a price before getting in, and be sure to pit gondoliers against each other. Be prepared to walk away … the price tumbles with every step that separates you from them. You can spend the rest of your trip in hostels. When you are visiting Venice with bae, you’ll want to impress them with at least a one night stay in one of the most romantic hotels in Venice. Make this event a distinct line item in your pre-trip travel budget so you can avoid anxiety over the sizable bill that this splurge will create, and you will spend the lead up to it in joyful anticipation instead of wringing your hands about all the money that is about to disappear from your wallet. Try to take advantage of flash sales on booking sites, as they can turn a $300/night stay into a $160/night stay with a bit of luck. Of all the hotels in Venice, we recommend the Hilton Molino, the Rialto, and the Continental for overall quality and customer satisfaction. If you do decide to skimp on accommodations, then use the realized savings to open your wallet for a dinner cruise out on Venice’s harbour. The Venetian Galleon is one of the best of the lot, as its traditional ship floorboards, rigs and sails are the real deal, but with some creative weatherproofing, the wind is minimized as a factor. The food is top quality, with local seafood, fine wine, and flavorful appetizers that includes prosciutto, making it a dinner out that you won’t soon forget.